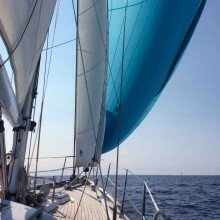 I am looking for one sailing crew companion to share a nice navigation. Mid June 2019 we shall sail south to Portugal, Madeira, Canarias, and across the Atlantic to Brasil and Uruguay. In December our voyage will continue to Patagonia and in 2020 we shall discover the Pacific. For the success of this voyage, long, difficult, but rewarding, motivation and good will is required, as well as being well mannered, non smoker and less than 1m74. Boat descriptionThis is a new built ship, with classic lines, luxury furnished, and fully equiped to sail around the world. Over the last two years I sailed about 6000 miles with her in various weather and sea conditions and she performs well.